The state of Karnataka is home to some of the awe-inspiring temples which are fine specimens of different dynasties that ruled the area. The architectural splendour of these temples has the potential of appealing to your sense of sight. Some of the famous temples in Karnataka are as folllow. 88 Km from Udupi and 12 Km away from Kodachadri, the famous temple town of Kollur is home to a shrine dedicated to Goddess Mookambiga. Adi Sankaracharya, the great India Vedanta philosopher, is credited with consecrating the image of the goddess. 93 km from Mysore and 170 km from Bangalore, the gigantic monolithic image of Gomateswara or Bahubali at Sravanabelagola in the Hassan district in Karnataka is a familiar sight in the state and is one of the most important pilgrimage destinations in Jainism. This is the tallest free-standing statue in the world is an architectural wonder. Shravanabelagola is a revered place for the Jains. Carved out of monolithic stone, the imposing 58 feet 8 inches high statue of Bahubali is the tallest free-standing statue in the world. Chennakesava Temple in Belur in Hassan district is the one of the finest specimens of Hoysala architecture. Built by Hoysala King Vishnuvardhana in the 12th century AD, the temple is intricately carved with sculptures, pillars and friezes. Belur was the seat of the Hoysala rulers who were great temple builders. The Ranganatha Temple at Srirangapatnam in the Mandya district of Karnataka is bears testimony to the architectural grandeur of the Cholas. A ninth century AD inscription refers to the contributions of the Chola monarch Aditya I to the construction of the Ranganatha Temple. 495 km from Bangalore, Pattadakal is home to the ancient temples of eastern Chalukyas, built in the 7th and 8th centuries. Virupaksha is the most famous of these temples. Virupaksha temples was ommissioned by Queen Lokamahadevi in the eight entury to commemorate her husband's (Vikramadiyta II) victory over the Pallavas. Sangamesvara and Mallikarjuna are the prominent temples at Pattadakal. The seat of the Early Chalukyas in anient iNida, Badami, 22 km from Pattadakal , is a huge drawcard for the spiritual seekers. Known for profusion of carvings, these rock cut temples were excavated during the reign of the Chalukyan king, Mangalesa. 10 km from Badami, Aihole is dotted with the temples reminiscent of the architectural glory of the Chalukyas of Badami. 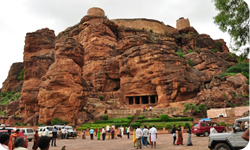 Durga Temple and Meguti Temple are the famous temples in Aihole. Durga Temple is the main highlight among the temples in Aihole. 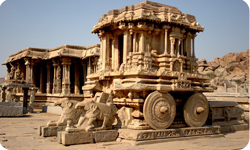 325 km from Bangalore is located the world heritage site of Hampi the ruins of which are testament to the splendor and affluence of the powerful Hindu Kingdom of Vijayanagara("City of Victory") in Medieval India. The Virupaksha temple dating back to the period of Greatest Vijayanagara ruler Krishna Deva Raya, is the crowning jewel of the temples in Hampi. The shrine is dedicated to Lord Shiva and his consort Padmadevi and is still used for worship. Located at a distance of 23 km from Mysore, Nanjangud is known for the gigantic Nanjundeshwara or Shrikanteshwara temple. Located on the banks of the Kapila river, the Nanjundeshwara temple is one of the biggest in Karnataka. Regular bus services are available from Nanjangud to Mysore. A masterpiece of the Hoysala creativity, Hoysaleshwara Temple is located at Halebid, 33 km from Hassan. Kedareswara is another temple at Halebid. 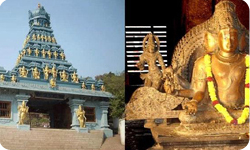 150 km from Dabolim in Goa and 519 km from Bangalore, Gokarna in Uttara Kannada district of Karnataka is home to Mahabaleshwar Temple, dedicated to Lord Shiva. The temple attracts thousands of devotees during the Shivaratri festival. 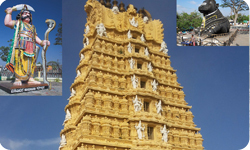 13 km from Mysroe, Chamundi Hills is known for Chamundeswari Temple that enshrines Chamundeswari goddess, the patron deity of the Maharajahs of Mysore. 45 km from Mysroe, Talakad is visited by the people for its Vaideshwara Temple, also known as the Kirti Narayana Temple, which lies buried under the sand dunes. Located on the banks of the river Kaveri, the shrine comes to life when it is excavated once every 12 years when devotees throng to pay the obeisance during the Panchalinga Darshan. 365 km from Bangalore 265 from Mysore respectively is located Mangalore where the temple on Kadri hills is dedicated to Lord Manjunatha. 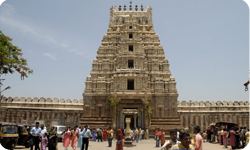 The most famous temple in Hassan is Hasanamba Temple which gives the city its name. 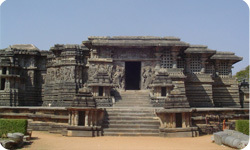 Siddeshvara Temple, built by Venkatappa Nayaka, is another prominent temple in Hassan.